Disclosure: This post was sponsored by Wild Blueberries of North America. Thanks for supporting organizations that align with my values and help make TFD possible. I was compensated for my time but as always, all opinions are my own! 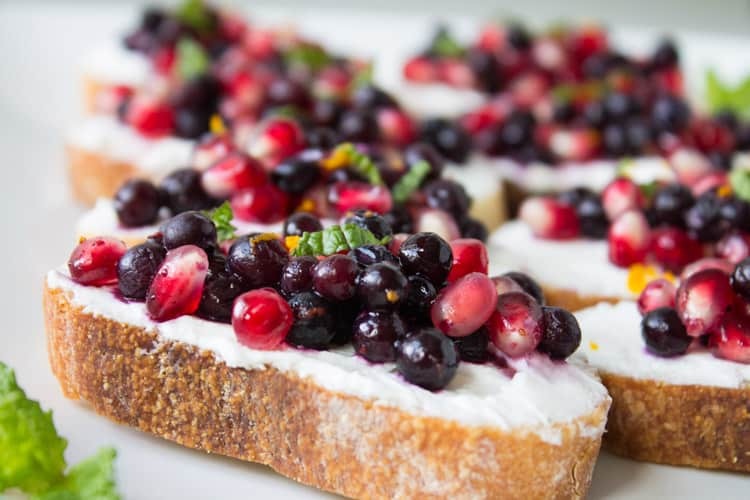 A festive appetizer for the holidays – wild blueberry and pomegranate bruschetta is sure to wow your guests with its vibrant seasonal flavors and colorful appearance. Guys. Where has the time gone?!?! Am I really sharing a holiday recipe with ya’ll today? Is it really already November?? I can’t believe the holidays are already around the corner (probably because it’s 70 degrees here in Boston this week). Have no fear though – I’ve got some pretty delicious holiday recipes lined up over the next couple months to help with your holiday menu planning. Starting with this one. Who doesn’t love a good bruschetta or crostini as a party appetizer?! It’s the perfect vehicle for seasonal ingredients, bold flavors, and healthy nutrients. 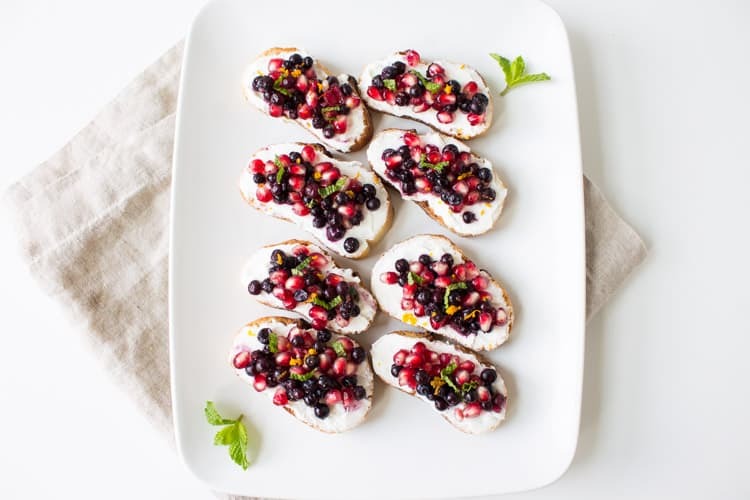 This bruschetta boasts seasonal pomegranate, antioxidant-packed wild blueberries, and hints of refreshing mint and citrus flavors. Not only is this appetizer a vehicle for fruits loaded with nutrients like fiber, vitamin C, and antioxidants, it’s also a vehicle for protein and calcium using versatile Greek yogurt as a spread. The flavor combos in this recipe are spot on but so is the texture and consistency. 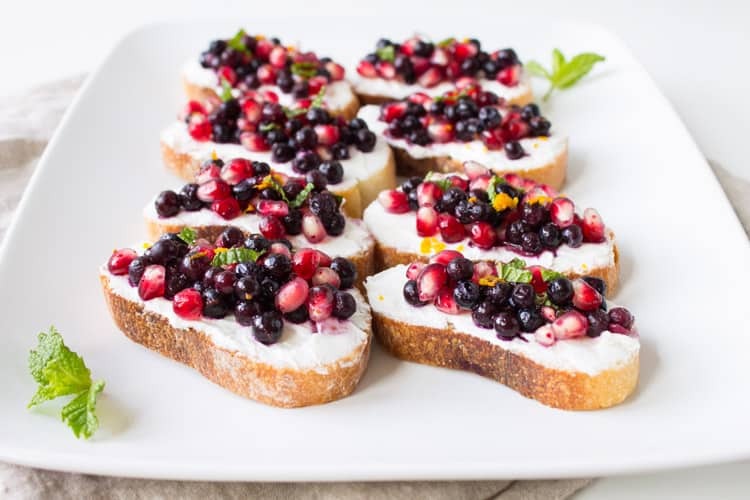 I love the crunchy baked baguette next to the creamy yogurt and goat cheese spread and finished off with the crunch and burst of juices in the pomegranate seeds. Plus, the COLORS. I mean talk about a festive plate for your holiday table. This is one of the reasons why I love using wild blueberries in recipes – their vibrant blue color makes for a gorgeous presentation. Plus, wild blueberries have 2x the antioxidants and fiber than regular cultivated blueberries – learn more about wild blueberries in my recap of the wild blueberry barrens tour in Bar Harbor, ME. 1. In a small-medium mixing bowl, add pomegranate aerials, mint, orange zest, honey and stir to combine. Let sit in the refrigerator for at least 1 hour or until ready to use. 2. Preheat oven to 375 degrees F. Lightly brush both sides of bread with olive oil and sprinkle with salt and pepper. Transfer bread to two baking sheets and bake for 8-10 minutes, flipping slices over halfway through. 3. In a medium mixing bowl, blend goat cheese and yogurt together using a hand mixer or transfer to a food processor and pulse until creamy and smooth. 4. 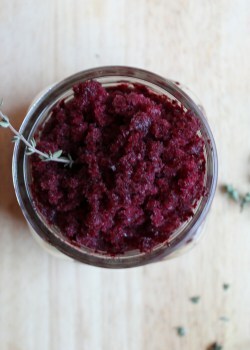 Remove pomegranate mixture from refrigerator and fold in wild blueberries. 5. To assemble the baguettes, spread yogurt mixture on top of bread (approximately 1 tablespoon) and add a spoonful of fruit mixture over top (being careful to avoid juices at the bottom of the bowl). Serve immediately. 6. Optional: Garnish with orange zest and mint. Try a whole-grain baguette for an extra fiber and nutrition punch! No Greek yogurt but plenty of cream cheese on hand? You can easily substitute cream cheese for Greek yogurt here. If you like the look of this recipe, don’t miss out on the holiday recipe inspiration that Wild Blueberries has to share. 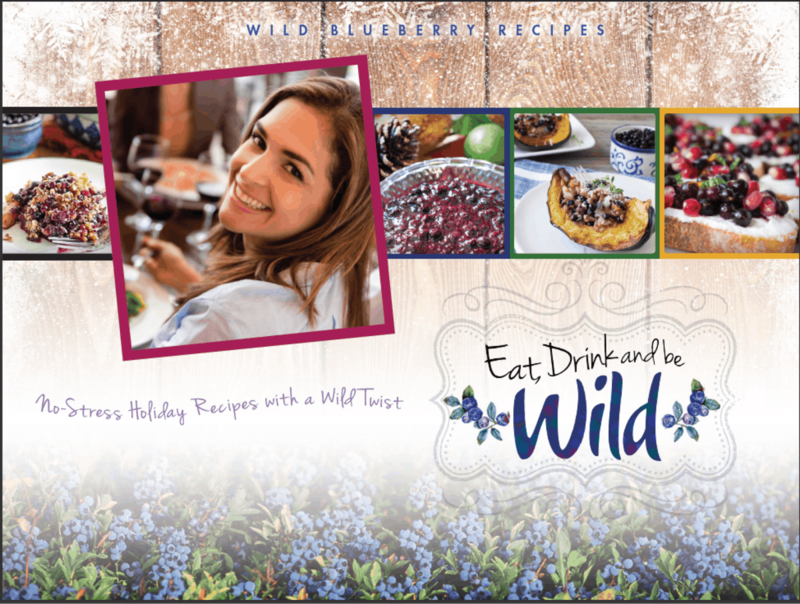 I partnered with Wild Blueberries to create a couple other holiday recipes – Wild Blueberry Pear Ginger Galette and Wild Blueberry and Farro Stuffed Acorn Squash – both of which can be found in the Eat, Drink, and Be Wild Holiday Recipe E-Book. All you have to do to enter the sweepstakes is head on over to their website and enter your email address – it takes about two seconds – sooooo what are you waiting for?? Get your recipe book stat! 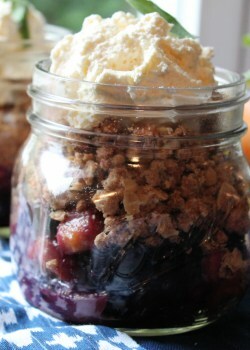 It also contains some delicious recipes from my RD friend Danielle Omar of Food Confidence like Wild Blueberry Baked Brie, Wild Blueberry and Apple Crisp, and Wild Blueberry and Ginger Relish. This bruschetta is so beautiful! I never thought of doing a sweeter version before. Definitely pinning for later! Gorgeous recipe and so much flavor packed in here! Im loving this sweet and savory recipe! Such a genius idea and perfect for the upcoming holidays! LOVE this recipe! I am a recent lover of goat cheese and found those wonderful wild blueberries at Trader Joe’s after I heard about them from The Spicy RD! 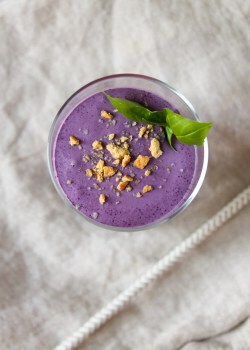 Love this recipe and so excited to check out the ebook, downloading now :)! Woohoo! Welcome to the goat cheese side :). Hope you enjoy the recipe and the e-book! A gorgeous, better-for-you appetizer. Love it! These are so pretty! I think pomegranate arils look like little jewels. Plus can’t go wrong with blueberries and goat cheese – such a good combo!